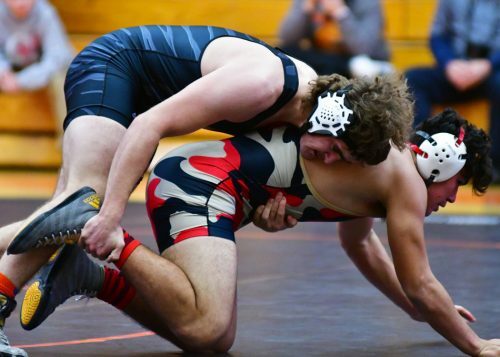 WARSAW – In a day and age where technology is king, Tuesday’s wrestling match between Elkhart Memorial and Warsaw came down to counting on fingers. After the two teams battled to a 36-36 draw after its 13 mat duals, coaches and match officials went to the old school art of tallying on hands to decide the winner. By a count of 7-6 in match wins, Warsaw deemed the extra point and won the Northern Lakes Conference match by a 37-36 count. Warsaw scored 18 points via forfeit, a rare sight against a very proud and historic Memorial wrestling program. 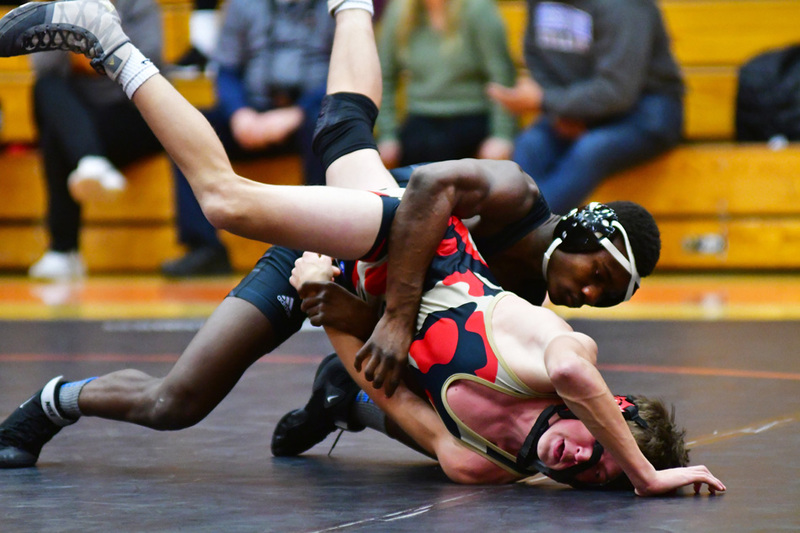 A pair of pins from Brandon Estepp at 160 and Jacob Bass at 145 gave Warsaw 12 more points, and a pair of decisions from Brock Hueber and Andrew Ross configured the mat scoring for the Tigers. How Warsaw got there was a snippet of what is shaping up to be a bounceback season for the Tigers. Estepp opened the night with a pin at 4:51 in the third period against Nathanael Schwalm after running out to a 7-3 lead before getting the slap with 1:09 to go. Bass got his pin after working out of some serious trouble in the second period. After taking a 3-0 lead on an escape in the second, Bass looked in control against Graham Elli until the Charger ran a nice series to get a takedown and a near fall. Bass would wriggle out of the hold and pull an escape, then work into a hold that Elli couldn’t break free from, getting the pin with 14 seconds left in the period. Brock Hueber works on Nathan Sabas. Brock Hueber got the first of the two decisions, holding off Nathan Sabas by an 8-6 score. Hueber held a 5-2 lead in the third period, and after the two traded reversals, and Sabas got another reversal, Hueber was holding on as the seconds ticked away. A last-second penalty gave Hueber a two-point win. Ross’ 4-1 win had the Tiger freshman score a first-round takedown and score a key reversal off the restart to beat Kayden Shepard at 120. Memorial scored five pins and a forfeit to achieve its 36 mat points. Clayton Lundy started off the Chargers with a pin at 19 seconds on Josh Pelfrey at 170. A forfeit at 220 and another quick pin by Cameron Lightner on Griffin Reed at heavyweight, just 45 seconds in, had the Chargers up 18-15. Joey Cole put Memorial up 24-18 after running a reversal on Isaiah Owens in the third period and rolling up a pin at 4:27 in the 126 pound bout. Brice Johnson ran a quick shot on Austin Brown and got a pin at 47 seconds at 138. In the final match of the night at 152, Kamden Goering looked like he was in trouble against Jose Grimmett in the first period. Grimmett ran out to a pair of convincing takedowns, only opening up enough for Goering to break out for a pair of escapes. In the second period, however, Goering found an opening and took it, getting Grimmett to the mat and onto his shoulders for a pin at 3:15. At 36-36, a flip through the scorebook and a confirmation from both Hueber and Memorial coach Brian Weaver concluded Warsaw had one more ‘W’ on the sheet and one more ‘W’ in the win column. Warsaw moves to 6-5 on the season and beats the Chargers (4-2) for the second time this season, a 58-18 blitz in the season-opening Tiger Invite two weeks ago. Warsaw will work for its next dual Dec. 6 against Plymouth.